New SOLIDWORKS sheet metal tips from Dassault in this video; scroll and click below to follow the link. With SOLIDWORKS sheet metal, you gain the flexibility to quickly and cost-effectively create sheet metal parts using 3D design. So, this cuts down your design time, manufacturing error time, quality assurance time and much more. You can bring any SOLIDWORKS models right into the sheet metal environment for conversion, and import your own custom parameters, like bend radius, K-factor, thickness and so on. 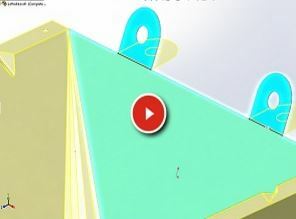 Click here to launch the video about SOLIDWORKS Sheet Metal tips from Dassault. We invite you also to check out Video-Tutorials.Net SOLIDWORKS sheet metal design course, for a comprehensive set of video lessons about how to use this versatile and useful SOLIDWORKS module: VTN SOLIDWORKS Sheet Metal course. Thanks! Rosanna D, VTN – for many sample videos about working with Sheet Metal, please check out my Youtube playlists at http://www.youtube.com/videotutorials2.